The Second High-level United Nations Conference on South-South Cooperation convened in Buenos Aires, Argentina, from 20-22 March 2019. Toily Kurbanov, Deputy Executive Coordinator of the United Nations Volunteers (UNV) programme, took part in the conference. His statement is published below. On the fortieth anniversary of the adoption of the Buenos Aires Plan of Action for Promoting and Implementing Technical Cooperation (BAPA + 40) among developing countries, the United Nations Volunteers (UNV) programme and its BRICS and Argentinian partners also organized the event: Volunteerism as a Powerful Solution for South-South Cooperation and Triangular Cooperation: Sharing Experiences of BRICS Countries. First, evidence suggests that UN Volunteers, and volunteers more generally, act as a means multiplied for achievement of SDGs. Volunteers help to deliver development services in most remote and marginalized communities: in other words to those who are left furthest behind. And, in the digital era, volunteers are already playing role in collecting real-time data about development risks and development impact, helping to track progress towards SDGs. Secondly, development is rarely a linear process. Looking forward, the world will face the increasing risk, inter alia, as result of climate-induced disasters. Wherever these shocks occur, always the first actors on the scene are volunteers — initially, community volunteers, followed by Red Cross/Red Crescent and UNVs — taking lead in relief and recovery action. Based on the global evidence, community resilience and volunteerism come together: not only for crisis recovery, but also, and increasingly, for crisis preparedness. Let me conclude with two observations. One, the evidence that I shared earlier, was made available in recent years thanks to Member States. Only last year, among 47 Voluntary National Reviews, presented at High-Level Political Forum, 29 have reflected on the role of volunteers in the pursuit of SDGs. We salute the Member States for recognizing the role of volunteer action in today’s world. 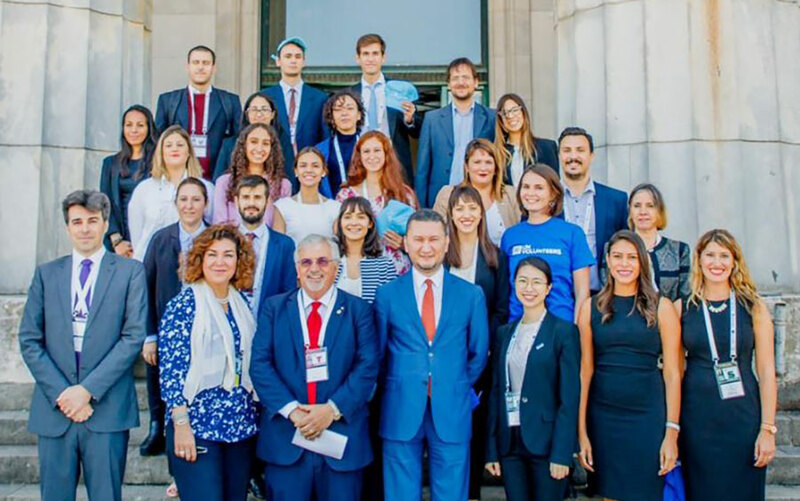 Lastly, let me take the opportunity to acknowledge more than 100 volunteers from Buenos Aires University, who helped this conference to run like a clock. These volunteers greet us at the entrance and take enormous role behind the scene. To them we say — in six official UN languages — muchas gracias, merci beaucoup, shukran, xiexie and bol’shoe spasibo.